2K and Gearbox released a teaser trailer for what appears to be Borderlands 3. Called “Mask of Mayhem”, the trailer shows familiar Borderlands characters that are (seemingly) frozen in time – they come together, along with other points of interest, to form the series’ infamous Bandit’s mask. Along with the teaser came the news of the Gearbox PAX East panel. Gamers will be able to view the livestream tomorrow, March 28th, at 11am PT/2pm ET/6pm GMT to learn more about this new title. 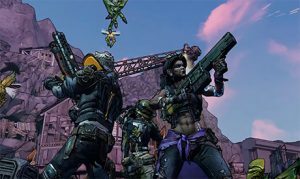 Gearbox has been hinting at revealing a new game at PAX – which most fans had hoped would be Borderlands 3 – for some time now. People are anticipating something grand. Here’s hoping we don’t get a battle royale spin-off or worse…a mobile game no one asked for.